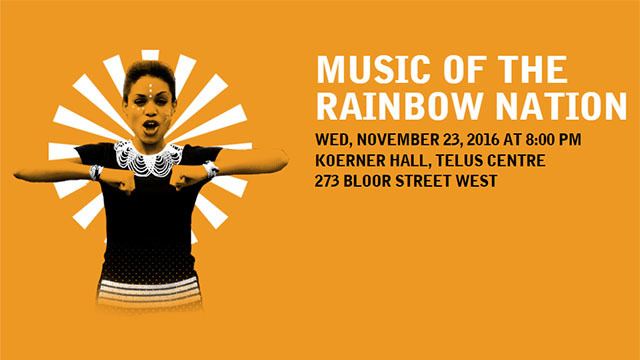 Toronto – Soundstreams continues its 34th season with Music of the Rainbow Nation. The evening explores Canadian and South African cultural identity featuring celebrated actors Kim Sanssoucie and Batsile Ramasodi, Juno award-winning vocalist Lorraine Klaasen, The Rainbow Chorus, rising opera-star Justin Hopkins, and a brilliant percussion ensemble led by Ryan Scott. Mandela’s dreams and aspirations unite the evening as words from his journals and diaries connect music with ideas that were close to him. As Mandela said: “the music of my own flesh and blood goes right to my heart.” South African actors Kim Sanssoucie and Batsile Ramasodi journey specially from Johannesburg to offer dramatic recitations and reveal the strength of his legacy. “The dream of the Rainbow Nation is as relevant to Canada as it is to South Africa,” says Artistic Director, Lawrence Cherney. South African-Canadian singer and interpreter of traditional South African township music, Lorraine Klaasen and her instrumental ensemble cover songs by her idol Miriam Makeba, a renowned singer and civil rights activist who took part in the Nelson Mandela 70th Birthday Tribute advocating for his release from prison in 1988. The Rainbow Chorus, a 16-voice choir including members of the Nathaniel Dett Chorale, conducted by Brainerd Blyden-Taylor and David Fallis, come together to give the world premiere of Futile Spells by Canadian composer Gabriel Dharmoo, originally commissioned by Soundstreams for the Nelson Mandela University Choir. They also sing work by South African composer Bongani Ndodana-Breen, who was based in Canada for nearly 10 years. Bass-baritone Justin Hopkins delights with selections from Kurt Weill’s Lost in the Stars: A Musical Tragedy (1949), the last Broadway show Weill composed before his death, inspired by Alan Paton’s famous novel Cry the Beloved Country. Hopkins also appears with The Rainbow Chorus. Toronto’s Ryan Scott leads a percussion ensemble with Michelle Colton, Alejandro Céspedes and Daniel Morphy in Abhaya by South African Kevin Volans, a dazzlingly virtuosic composition distinctly influenced by South African rhythms. Koerner Hall, TELUS Centre for Performance and Learning, 273 Bloor St. W.
A pre-concert chat with Artistic Director Lawrence Cherney and artists will be held at 7:00pm before the performance. Tickets range from $47.50-$67.50 and are available through The Royal Conservatory Box Office at 416-408-0208 or online at soundstreams.ca. Soundstreams is one of the world’s leading contemporary music companies, and the largest global presenter of new Canadian music. Artistic Director Lawrence Cherney and Executive Director Ben Dietschi are committed to showcasing the work of living and international composers with a focus on innovative thematic and experiential programming. Soundstreams maintains its commitment to the larger community with Salon 21, a free series offering performances contextualized through engaging discussion at The Gardiner Museum, as well as composer training activities, the SoundWave program, which promotes accessible tickets to those 35 and under, and the creation of digital performance spaces.